Medical practices today face an unprecedented economic challenge. Reimbursement from third-party payers continues to flat line while self-pay soars as a percentage of accounts receivable. 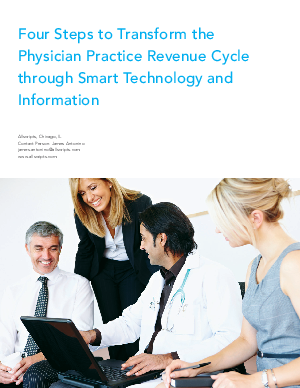 In this environment, effective revenue cycle management has become more important than ever. A physician group that manages its billing and collection operations properly can boost its profitability, even in the current payment environment. One that does it poorly will limp along and may be forced to cut physician compensation. Over the years, medical billing and collection has become immensely complicated and labor intensive. Health plan rules are constantly changing; claims may be denied for myriad reasons; benefits often change as employers seek to cut costs; and it is increasingly difficult to collect money from patients, who now pay more of the bill than ever. To overcome these challenges, leading medical groups are taking advantage of a new generation of sophisticated practice management applications and cloud-based revenue cycle management (RCM) solutions that are helping to correct the balance of power between payers and providers. These end-to-end solutions not only increase automation, streamline workflow, raise clean claims percentages, and speed payments. They also provide actionable business intelligence that can transform revenue cycle operations and improve financial performance.